Remember this book? The one Power of Moms put together about deliberate motherhood? Well, a national publisher picked it up last year, revamped the cover, and launched it Tuesday to booksellers all over the nation, including Barnes & Noble.The new cover looks like this. It’s spruced up inside with some additional edits. And POMs is having an event next Wednesday night where Saren and April, co-founders of Power of Moms will speak, as well as Linda Eyre. I will also have a few minutes to try and say something intelligent. Key word there is try. So in honor of Tuesday’s launch, I’m giving away a copy of the new book. Just leave a comment at the end of this post and you’re in for the draw. We will also be doing a book-signing at the King’s English bookshop November 7th, if you live local and would like to swing by. And I am excited to announce Power of Moms has a second book that will be coming out this year. It includes three essays I wrote back when the boys were small. It’s funny – I think I wrote better and more often when I was nursing babies. Once they became mobile non-nappers… whoosh! Life charged into a different kind of busy! I think it’s lovely. Inside and out. 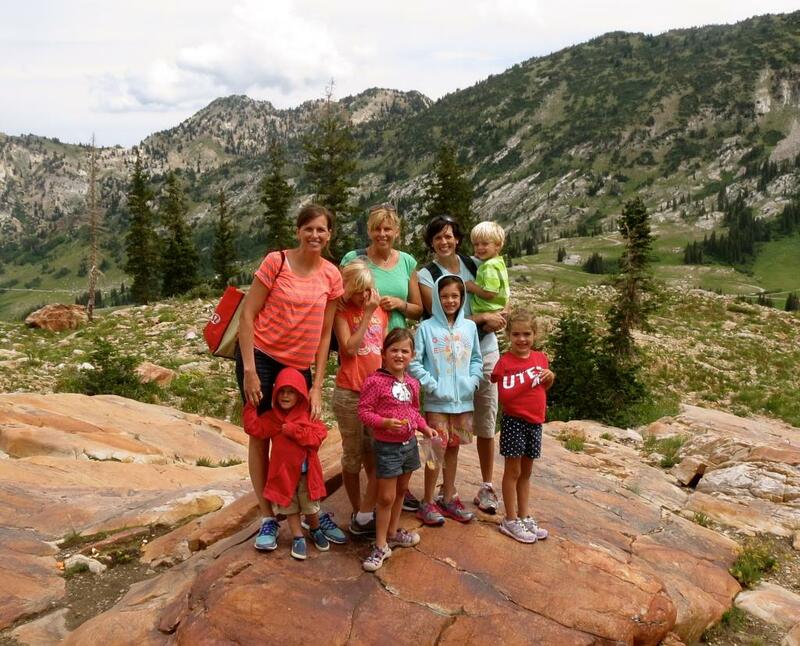 This summer, Saren, Saydi (Eyre sisters) and I met up at Albion Basin to hike with our kids. We moved in a fairly large, but strung-out pack. As we made our way up the mountain, an older woman with curly hair in a pony tail, passed us. She was hiking with two younger women I assumed were her grown daughters. I guided my children to the side so they could pass, expecting the typical commentary: “Boy! What a crew!” Or “You sure have your hands full!” Or “Hope you make it before sundown!” But what came out of her mouth made me stop, turn around, and look at her face. Her words caught me by surprise. The tone of her voice was so refreshing, without a twinge of sarcasm. Not what a mother of five usually hears. We said, “Thank you!” and looked at our string of children, climbing rocks and traipsing through wildflowers. It’s all how you see it. What you see. What you feel. And upon inspection, it was beautiful. Saren’s older children buddied up with my little children. No one asked them. They just saw the need and stepped in. Saren’s Eliza guided Gordon up the mountain. Isaac looked out for Spencer. And Saren’s twin boys included mine, hiked around the lake with them, picked out walking sticks. All of her children made sure mine were safe, threw rocks with them, even made potty stops. It was wonderful to have such helpers along the trail. I hope I can teach my children to be so selfless, insightful, and kind. I love these two ladies. Saydi and Saren. They are tremendous mothers and mentors to me. They have changed my mothering. They’ve helped me see what deliberate motherhood is about. That it really does matter what kind of mom you are. It matters if you are available. It matters how you see your children, and the world. It matters how you view yourself and this role of raising a family. It matters every day what you do and say to your children. And yet, perfection doesn’t matter. It’s the imperfection of what we’re doing, the big gigantic mess of what we are building, and the way we embrace it, that does. Every day we work to see it right, navigate it right, throw ourselves in with all we have. And when we mess up (like I did last night), well… we mend the fence, hug and kiss so they know we love them, pray for forgiveness, and start over tomorrow. After a series of disobedient acts, I lost my cool with Sami. I put her in time-out, raised my voice. I was angry. And she had been out of line. After some distance from each other and time to calm down, I saw her in the kitchen coloring something. A few minutes later I noticed her outside the living room window. She was standing across the street holding a star in her hands. So I walked outside towards her. And when she saw me coming, she smiled. Her arms still reaching long. Her star still hanging in the sky. Who thinks of such things? The pure ones. They do. I caught a photo of my little star. Shining across the street. Being the beacon I wasn’t. Being the example of forgiveness, and light. Light like a shaft through darkness when you see things as they really are. Light like a feather when you learn to let go. Hard to imagine being angry with this sweet face. Eyes still red from tears.Oh, motherhood is hard. So hard.But to have it identified and named – as beautiful as the mountain – on a dusty trail, with unkempt children and scraped up knees. To have a Sami to straighten me out, put my heart back in place, pull her small body close to mine. That is beauty. And I guess it’s the crazy, push me to the farthest limit days, that make these beautiful moments so profound. It’s a new day. And I am glad. p.s. I forgot to mention: if you don’t win a copy of the book in this giveaway, you can buy a printed or digital copy and send your receipt to POMs for complimentary access to their Deliberate Motherhood podcast series (valued at $20). More info here. Love this post! And I've been anxious to read the book. Thanks for your amazing example of a deliberate mother! deliberate mothering is something I am thinking a lot about. I always love reading your posts. I would love a chance to win the book! Also I just wanted to say how fun it is to read a mother of two sets of twins! You are such a wonderful mother. We have a set of twins (started our family with a bang) and it is so very rewarding. Thank you for your example. I love the realness of this post and how you shared an example of seeing your daughter and the goodness even after a not-so-great moment. Thanks! I've been trying to get a copy of Deliberate Motherhood for months with no success – now I know why! Can't wait to read both books, truly. (I'll be hitting up Amazon next payday for sure). I am really excited to read this…I assume it will still all ring true even for me who has older children, now. It is hard to admit that everyone around me WAS right. The time DOES go by far too fast. Appreciating where you are right now is so important because it is quickly a memory. Loved your post! Ooh ooh, pick me! My 4 year old dropped my phone into the toilet today. The phone he wasn't supposed to be playing with…and amazingly I didn't freak out. He needs a special kind of deliberateness and while I often get it wrong, occasionally I get it just right. I love these little kids we are entrusted with. You are amazing! I am Trina's cousin, Kass, and have admired you since I met you back in the mission days with Sis Bybee. What a beautiful family! Thanks for opening your heart. I would love to read the book! I love the quote from the lady. Beautiful. And I want BOTH books. Sound like lovely reading. Where is the event at that you are speaking at? I probably won't be able to make it, but I'd like to know anyhow. beautiful piece. the quote from the woman on the mountain brought tears to my eyes. I'd love to win the book! I would love to read this book! You all are amazing, inspiring women and I appreciate your efforts in helping me along this journey of mothering. Adri – i love catching glimpses of your mothering. you are a gift to your children. Kristi – love you. I do. The Gearys – started your family off with a bang! now that's the truth! and you're so right; it is rewarding! Emily – the difference is in presentation, flow, and technical edits. content is mostly the same. new book has a sleeker look, nicer feel on the interior. i like the font and subheadings better. and all authors went through content carefully with an editor from familius to tighten chapters, improve fluency, and make sure there was no redundancy. hope that helps! thanks for your comment! Kel – why didn't i give you a copy when you were here?? did my other books ever arrive? Shells – I love you. I need to hang around you. it feels so good, doesn't it, when we hold it together? and you're spot on about certain children needing a special kind of deliberateness. not too much of some things, and just enough of others. love your beautiful children. they're getting so big! Elizabeth – you're another one i've been meaning to email. Bob Stephenson spoke about your dad last sunday. i included him in my fast last week. how is he doing? heart drawn out to you right now. sending lots of love and faith your way. Angie – yes, the woman on the mountain. she stopped me in my tracks. thanks for coming here. I wasn't very precise when I asked about the two books (not different editions of the same one)–How would you describe Deliberate Motherhood vs. Motherhood Realized? Thanks! You're such a wonderful mom! I love keeping up with your family through your blog. Thanks for helping me keep the right perspective as a mom. I'd love to read the book! I have you on a pedastal Cath, so I have to admit that I like hearing that you are human and you yell at your kids! 🙂 I'm so glad we get to see each other more often! I'd love to read that book. Beautiful words…your writing is so eloquent. Thank you for sharing these simple truths. I admire you so much. Thank you for taking time to write. I would love to read the book! I would love to win this book. Thank you for your thoughtful and beautiful words. You are so good at helping us all remember what motherhood is really about! I'm excited for your new book that's coming out. I look forward to reading both of them! How excited I am that Deliberate Motherhood was picked up by a national publisher – I've been checking the library for months, hoping they'd have a copy for me to borrow, and now perhaps they will! I appreciate the insights you share here that help me refocus and remember what a gift it is to be a mother. Thank you! Natalie – you cute mommy! Feels like not very long ago we were pushing a handcart together on the Marriott Ranch! Thank you for reading! Noni – I love your name. Knew one other Noni in my life, a tremendous singer and songwriter. Agree. Moms Matter! Thanks for coming here. Karen – Thank you for your comment! Krystal – thank you for reading! mouse – I'll draw the winner next week. Thanks for your kind comment. Mary – sure love you! AJ – What a beautiful heart you have. Peeked at your blog. And such strong, thoughtful words. Thank you for coming here. I'll pursue the library option and send word to our publisher. I never thought about who and how that gets done. Thanks for the suggestion! What a wonderful blessing it is to be a mother! I have just recently stumbled across Power of Moms, and was directed to your site for your Women's Conference talk from my sister. WOW! I am inspired by your story, testimony, example, and passion. Very excited to continue following and trying to improve the way I mother. Thank you for sharing your stories and lessons learned! This was such a beautiful post. Thank you. I would love to win this book! I really love this. It ISso hard and yet I need it so much to become. They are the best teachers, it's humbling for sure! Oh my goodness! This is just what I needed to hear today… I think I may have been watering some weeds today! Thank you. I hope I'm not too late to enter! I would love to win the book! I am so grateful that you keep this blog. I really enjoy reading your tidbits of wisdom and perspective. Your Sami's Star story just made me cry thinking about how my daughter too, is so quick to do sweet things like that. So lovely, thanks for sharing! I loved your article, "Come Signing and Singing," and forwarded it to a friend. She was already following your blog, and sent me here. Beautiful post, and I would love the book! I love this….you're such a good example. I hope the giveaway is open internationally, I'd love a copy of that book! Made me cry. Every Mom has a star put up for them in the sky. Love this post! Especially your experience with Sami…so tender. I'm so excited POM is releasing a new book! How wonderful! Hey! I'd love a signed copy of both of your books. Should I buy them then try to find you? jkdekelly – i absolutely agree! heather – so glad you came to visit. i hope you return often. blessings! Cheryl – I would LOVE to meet you! Mavis. Ha! I had to ask her the other day where the nickname came from. Very tender. Callie – thanks for reading. Kati – it's true. they are our most honest teachers, aren't they? The Watkins – watering weeds: we all do it. but it's so good for me to remember how unproductive that is! Cristina – yes, their forgiveness. It humbles me to the core. Heather – thank you. I hope keeping this blog is worthwhile. Blessings to you! Rebecca – children. yes, so pure. examples of how we ought to be! Kat – so glad you left a comment! thank you. Rick – hey you! I'd love to get you copies of both (second book comes out in the spring). Amazon offers the best price right now. If you don't win here, buy a copy and we'll find a way to cross paths! Beautiful post! I would love to win a copy of the new book!